Surgicel® is oxidized regenerated cellulose. 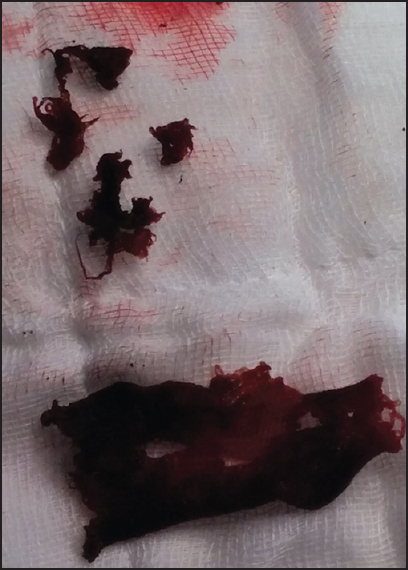 It is frequently left behind on the surgical bed as a hemostatic pack for controlling capillary, venous, or suture line bleeding postoperatively. As it absorbs blood and gets saturated, it gently swells into a brownish black gelatinous mass which aids in the formation of clot. In some instances, the Surgicel® may expand substantially to encroach upon the adjacent luminal structures. We report two cases of avoidable morbid external compression after major cardiac surgeries due to Surgicel®. The first patient was a 3-year-old, 10 kg girl diagnosed to have Tetralogy of Fallot previously palliated with right modified Blalock-Taussigshunt surgery at 6 months of age. She had resting oxygen saturation of 77%, echocardiogram demonstrated large malaligned subaortic ventricular septal defect (VSD) with severe infundibular and annular pulmonary stenosis. Cardiac catheterization confirmed small-sized pulmonary annulus (Z score -3) with left pulmonary artery (LPA) origin stenosis. After redo median sternotomy, cardiopulmonary bypass was established through aortobicaval cannulation. Reconstruction of right ventricular outflow tract was done by infundibular muscle resection and transannular bovine pericardial patch (TAP) extending beyond the LPA origin. There was bleeding from the needle holes in the TAP around the LPA origin. This was controlled using Surgicel® packing. After hemostasis, the patient's chest was closed and shifted to the intensive care. Echocardiogram before extubation on the next day revealed moderate right ventricular dysfunction, and right ventricular systolic pressures were elevated to 65 mmHg. 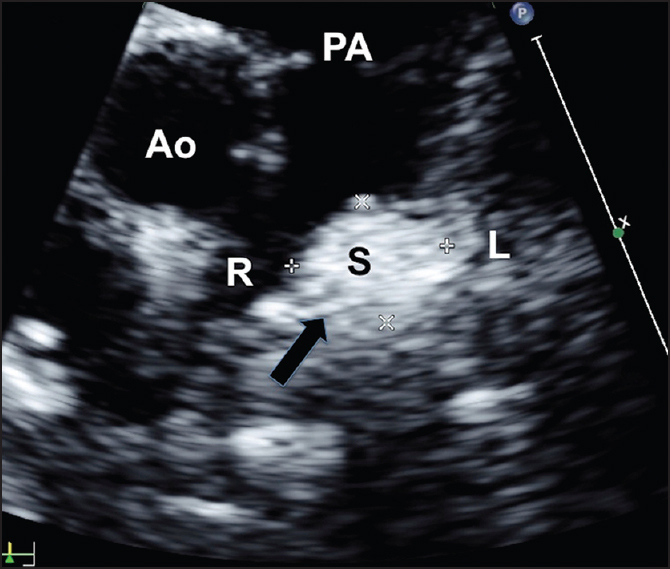 There was a large, well-defined echogenic mass of 15 × 11 mm size, occluding the LPA origin [Figure 1]. The obstruction to the LPA flows was earlier thought to be due to large thrombus or a foreign body. Cardiac catheterization was considered, but deferred after discussion with the concerned surgeon. Reexploration was then undertaken to evaluate the reason for obstructed LPA flows. After reopening, right ventricular contraction looked poor. From the distal end of TAP, remnants of Surgicel® were gently removed. 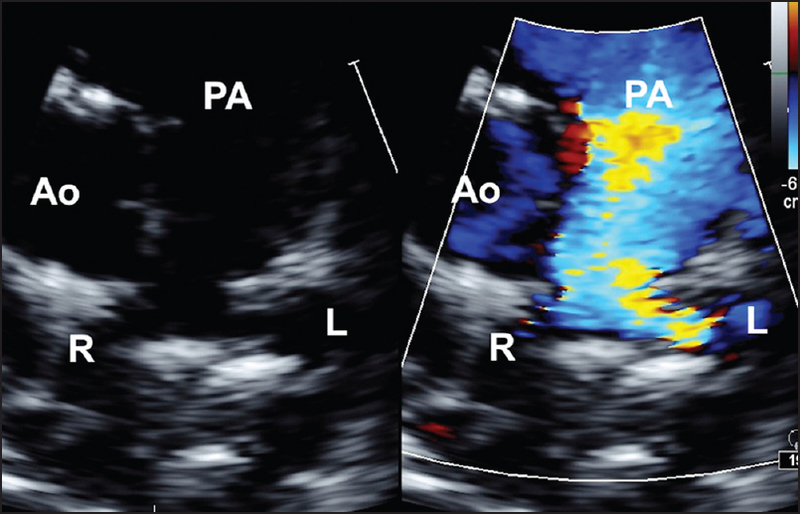 This normalized the blood flow across LPA on echocardiography [Figure 2]. Right ventricular contractility normalized due to reduction of right ventricular systolic pressure to 30 mmHg. The large echogenic mass in the region of confluence also disappeared. After extubation on the same day, the postoperative course was uncomplicated. The second patient was a 5-month-old cyanotic boy weighing 5.4 kg with double outlet right ventricle, large subpulmonic VSD with inlet extension, and left and anterior malposition of the aorta. The coronaries arose from the facing sinuses. After surgical correction that involved arterial switch operation and VSD patch closure, the cardiopulmonary bypass was weaned off easily in sinus rhythm. There was bleeding around the posterior inaccessible left coronary button, which was controlled with Surgicel® packing. The mediastinal drainage volumes were negligible during the observation in the postoperative intensive care. Following day, there was a cardiac arrest due to ventricular fibrillation that failed external defibrillation. The chest was reopened for internal cardiac massage. The surgical bed revealed swollen Surgicel® behind the aorta under the left coronary button. There was an immediate hemodynamic recovery after removing the mass [Figure 3]. The subsequent postoperative course was uneventful. Our first patient suffered compression at pulmonary artery bifurcation leading to right ventricular systolic dysfunction. Suspicion of pulmonary artery thrombus ran through the echocardiographer's mind till it was discussed with the operating surgeon. Prompt surgical removal of the Surgicel® quickly relieved the narrowing. In the second instance, extrinsic compression of the aortic root by the Surgicel® after the arterial switch operation compromised the flows in the proximal coronaries causing myocardial ischemia. A similar situation might arise following surgeries like Bentall's procedure, Ross operation, David's procedure, and surgical repair of anomalous origin of left coronary artery from the pulmonary artery. Incase of any unexplained ventricular dysfunction or fibrillation, even after 12 h of surgery, compression from Surgicel® should be anticipated. We did an ex vivo experiment with Surgicel® and heparinized blood. [Figure 4]a shows that immediately after immersing in heparinized blood measures 3cm, while after few hours it becomes 3.3 cm [Figure 4]b. It is probable that with greater movements of heart and prolonged exposure to heparin reversed blood, it may swell further. In pediatric population special care should be taken, use of Surgicel® should be very judicious, only small strips should be used if at all deemed necessary. No stuffing should be done in any area. It is perhaps useful for cardiologists, intensivists, and surgeons to know how the echocardiographic image of Surgicel® looks like [Figure 1]. A mention about its site of usage in the surgical notes will make it easy to retrieve it and prevent catastrophe even if the operating surgeon is not available. Pierce AM, Wiebkin OW, Wilson DF. Surgicel: Its fate following implantation. J Oral Pathol 1984;13:661-70. Buckley SC, Broome JC. A foreign body reaction to Surgicel (R) mimicking an abscess or tumour recurrence. Br J Neurosurg 1995;9:561-3. Eto K, Matsumoto M, Kubo Y, Kemmochi R. Superior vena cava syndrome caused by a swollen absorbable haemostat after repair of ischaemic mitral regurgitation. J Cardiothorac Surg 2014;9:1. Teis A, Cámara ML, Ferrer E, Romero-Ferrer B. Critical stenosis of pulmonary homograft induced by surgicel in ross procedure. Asian Cardiovasc Thorac Ann 2010;18:382-3. Menovsky T, Plazier M, Rasschaert R, Maas AI, Parizel PM, Verbeke S. Massive swelling of Surgicel® Fibrillar™ hemostat after spinal surgery. Case report and a review of the literature. Minim Invasive Neurosurg 2011;54:257-9.